I love pasta. I’ll take all the carbs if you aren’t having them. The only time I’ve seen squid ink pasta is on the Food Network or on the menu of some fancy schmancy place. And to be honest, I’ve been to some fancy places and ordered the pasta dishes. And I was not too happy to be eating over priced boxed pasta. So, rather than have this out, I made this in. I just happened to have visited my local H-Mart to get some seafood to serve with this. And while I was there I was in the pasta aisle. Another 12 ounce package of squid ink pasta was available for just over $5. It was fettuccine, but that is still double the price here. In fact this package will only set you back $1.99. Now in researching this product a bit further, the company has a website and some of the pastas seem eerily familiar. Trader Joe’s is notoriously secretive as to who manufactures their products, but there seem to be striking similarities between certain varieties pictured. I’m referring specifically to the orecchiette, capunti, and the trofie. Those products are also made in the “heel” of Italy. Now, this pasta has a deep black hue to it which did not make the pasta water look like there was a squid attack. Speaking of squids, for the most part pastas like this are made with cuttlefish ink. It lends a lot more color than it does taste. There is a subtle brine flavor, but I did not notice it too much. Someone who does not like seafood might be inclined to notice is more than I did. The directions were on point and I removed mine al dente. I opted for mussels with shallots, garlic, lemon, and white wine with my dish. Most recipes you’ll find online will feature seafood with this although it would pair well with other proteins. Overall, fun to try and a fraction of the cost elsewhere. It makes for a fancy looking meal or one where people around you stare at what you are eating. It’s worth a try once and it isn’t too much of a premium over the cost of regular pasta. Would I buy this again? 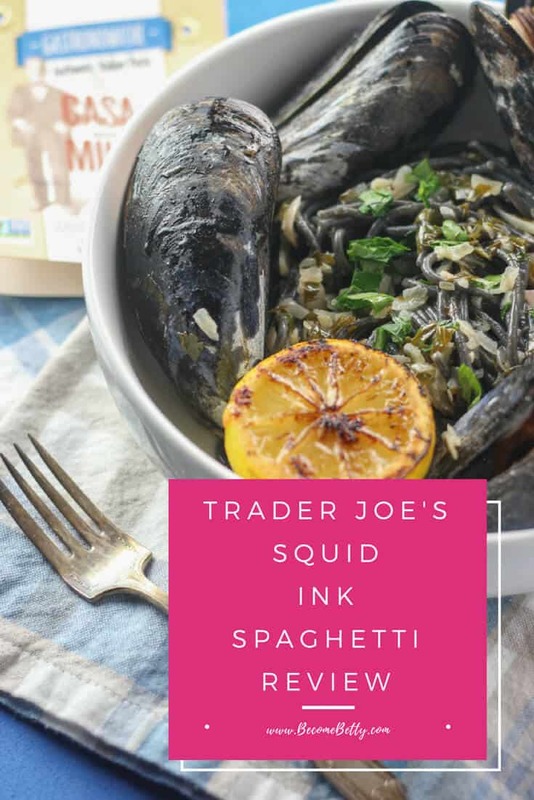 Yes, I would buy Trader Joe’s Squid Ink Spaghetti again if it is still available. Don’t forget to share your thoughts by going to the user review at the bottom of the box (click on the number of stars you believe this product deserves) or leave a comment below. Product Description: This is Casa Milo's Squid Ink Spaghetti that is available on the shelves of Trader Joe's. This product is a new addition to the pasta aisle. 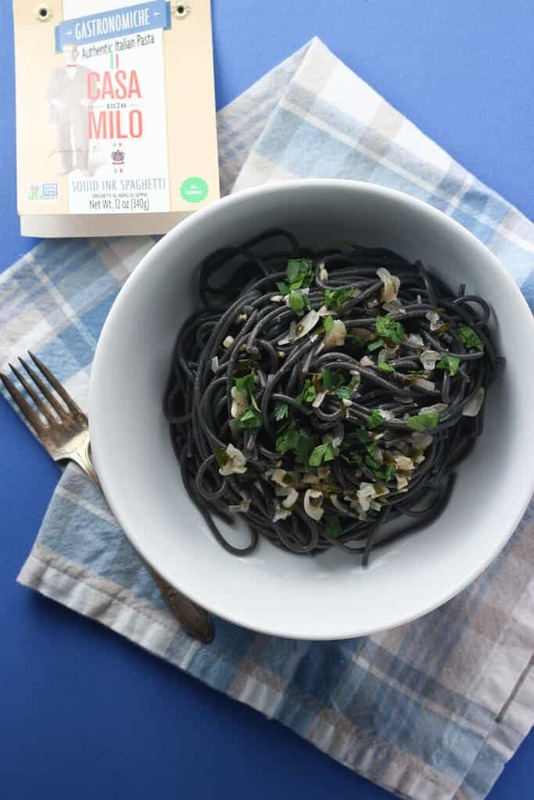 Squid Ink Spaghetti adds a fancy color without the fancy price on to the shelves. This is actually a Casa Milo product. 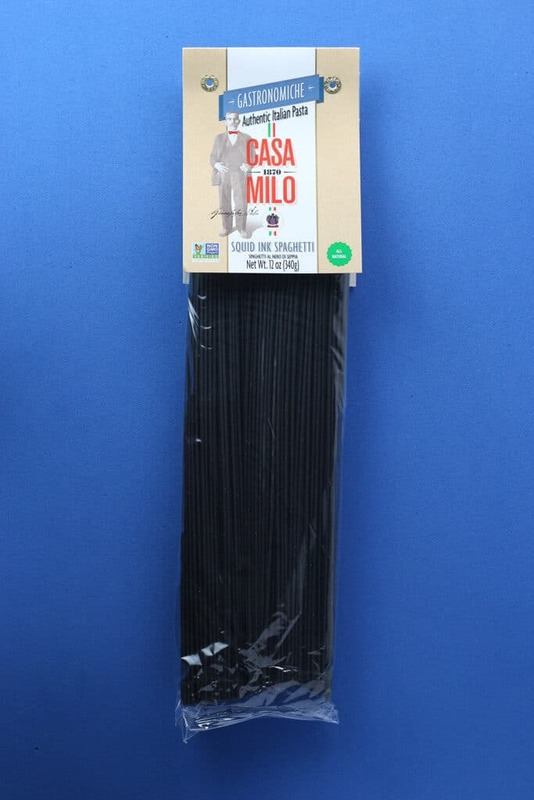 Trader Joe’s Squid Ink Spaghetti is made by Casa Milo and this is very well priced. By having the Casa Milo name on this pasta, it now makes wonder if this is the company behind some of the other artisanal pastas that we’ve seen recently. 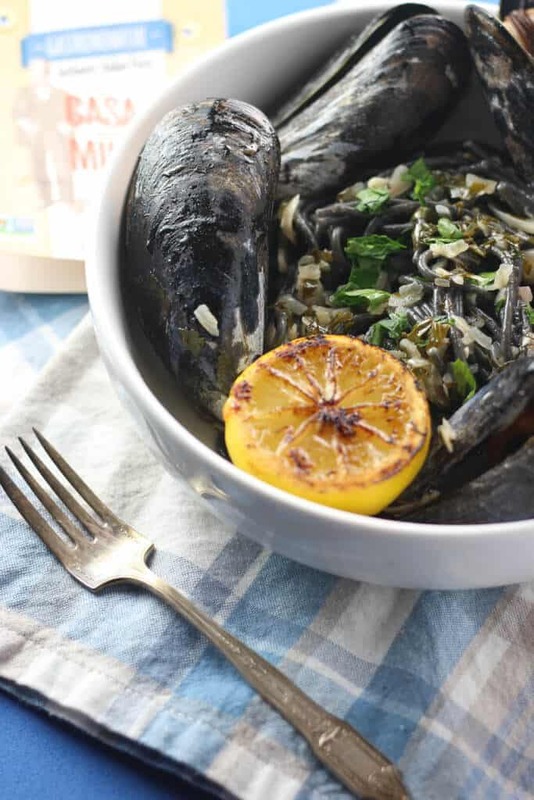 Looks really good, wish I liked squid ink pasta. I tried to make it earlier this year after I bought some fresh fettuccine con sepia and it was just too briny for me. I wanted to turn in my Sicilian and seafood badges after that, but I guess we can’t love everything. Hey Buyingseafood! I’m wondering if the fresh pasta retained more of the flavor than the dried did. I guess I’ll have to get some ink and experiment with it. Don’t feel you need to turn in your Sicilian anything. My husband is Italian and doesn’t like red sauce. It’s totally ok in my book to have things that you do and don’t like regardless of who you are. Thanks so much for taking the time to stop by and share! I think you are right about the fresh vs. dried. Thanks for the kind words and thanks for your work. I don’t shop at TJ’s much but when I do, it’s good to know about these products beforehand. Halloween is ON!!! WOOHOO! I’ve always had to either special order squid ink pasta or as of recently, buy off Amazon. 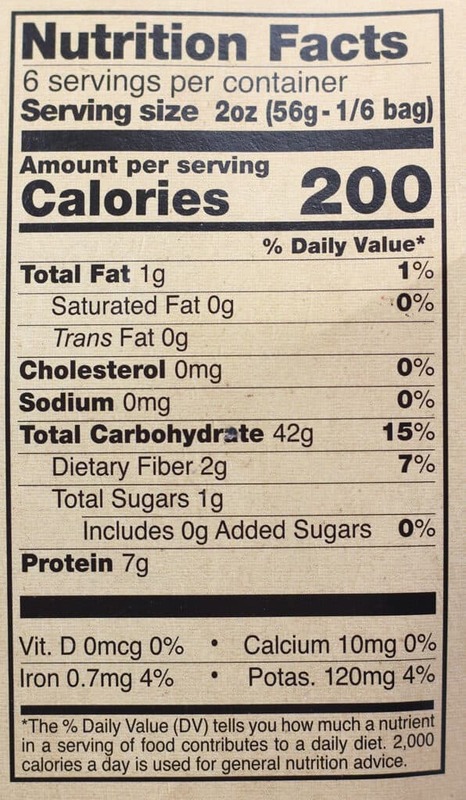 This is GREAT news, and I hope OUR Trader Joes is carrying this product. BEST RECIPE: Black Pasta in a Pink Gorgonzola Sauce from Allrecipes.com! Hey Mychols Fabulous Playground! I agree this is a good news. If you didn’t see it yet, you’ll see it soon. I try to get things as they hit shelves. Do you have the link to that recipe? I’d love to give people ideas as to what to do with this. Thanks so much for taking the time out of your day to stop by and share.